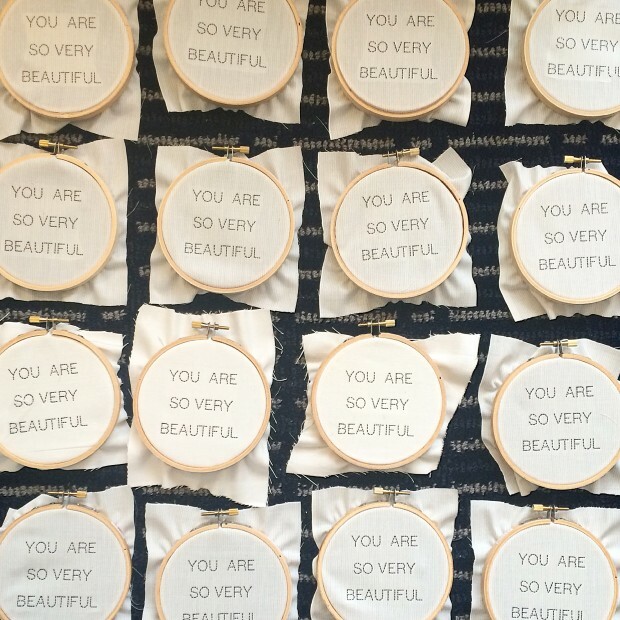 You Are So Very Beautiful Archives - craftivism. Sometimes when you come up with a project it’s hard to tell people what it’s all about. 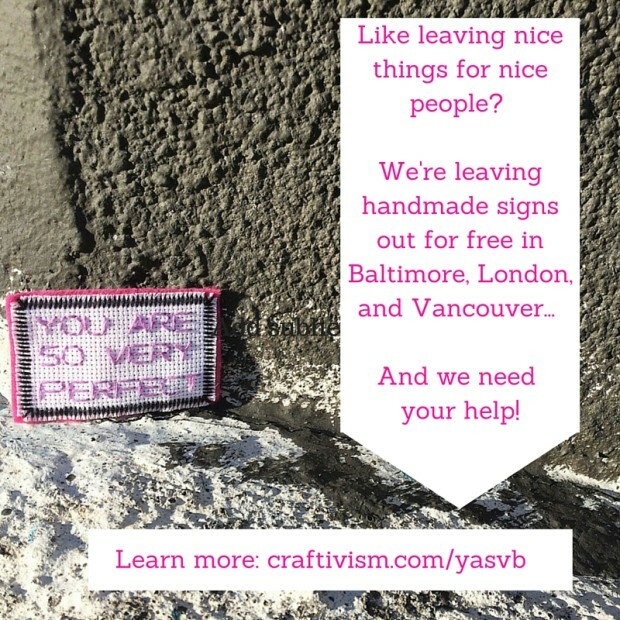 Therefore, I hired Janice Smith of Big Dog Little Bed to film a little video explaining craftivism and You Are So Very Beautiful. This project has involved stitchers from all over the world, for which I am so thankful for! The stitches in the video are Olisa Corcoran, Katherine Bates Ruiz (and her adorable son, Michael! ), Rebecca Gibson and Barbara Berry. Janice came over to my house one day (that’s my grandparents’ chair that I’m sitting on, the one I used to line up my dolls and stuffed animals on when I was a kid, and, yes, there is a Sadie cameo!) 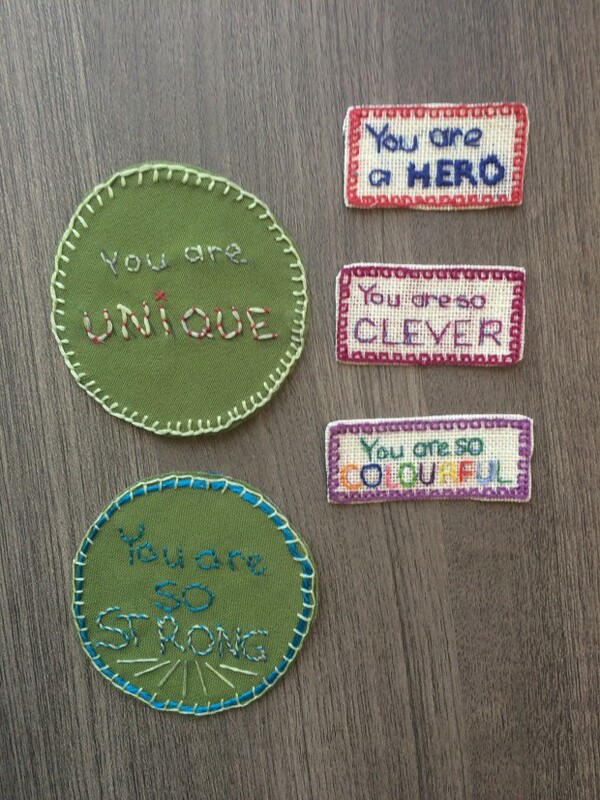 to talk to me about the project and craftivism, which was a lot of fun! She also followed us around Durham as we put out signs for You Are So Very Beautiful as well! 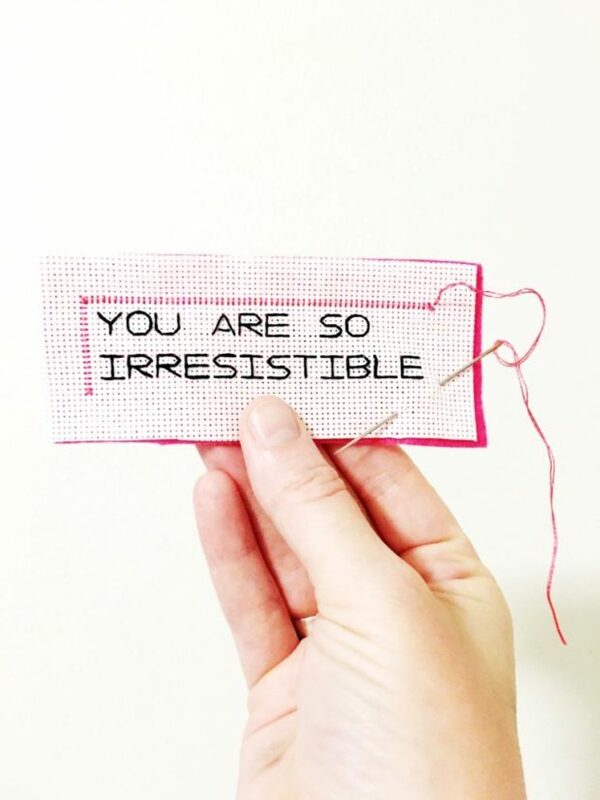 Recently I was lucky enough to be on Vickie Howell’s CRAFT*ish podcast, where we talked about craftivism, the influence of Riot Grrrl, crafting through depression and more. 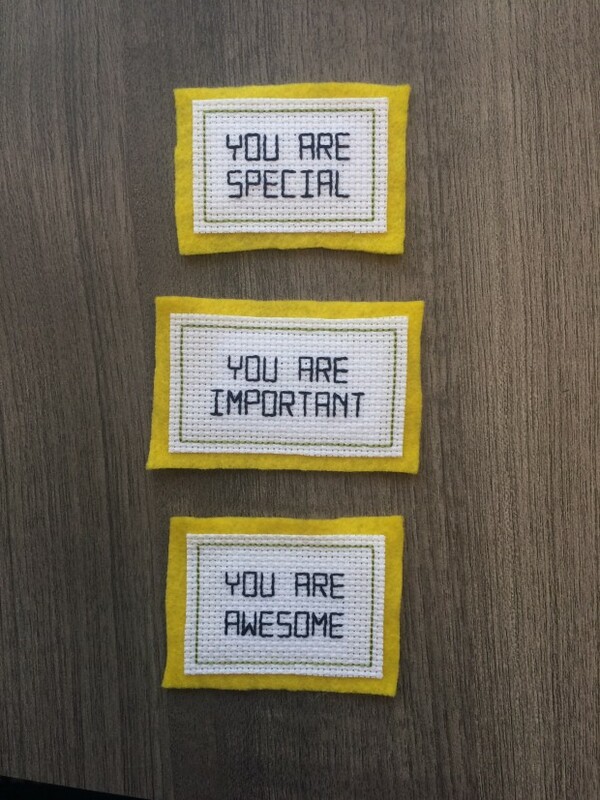 I also talk about You Are So Very Beautiful, how it became a very special project in my life, and how stitching affirmations helped me work through some icky feelings, practice a little guerrilla kindness and help others in the process. Having been inspired by Vickie’s work for years, it was great to talk to her about what I’ve been up to! 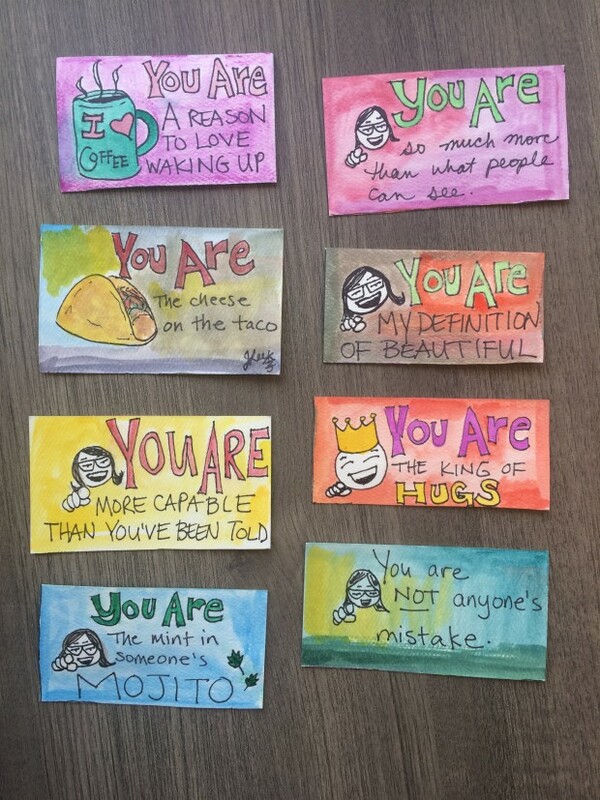 Months ago, I had a crazy little idea to make affirmation signs. Because there were things that I needed to hear. Because there were things I wanted to tell other people but also chickened out on. Because I want everyone to feel worthy, even though I know that society often tells us we are less than. 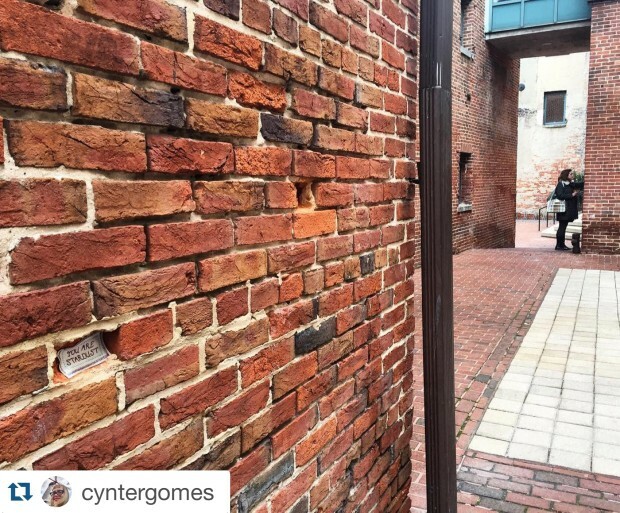 You can read a rundown of how things went in Baltimore over at Uncustomary, Mary did a fantastic job both helping me with this project and writing about it! 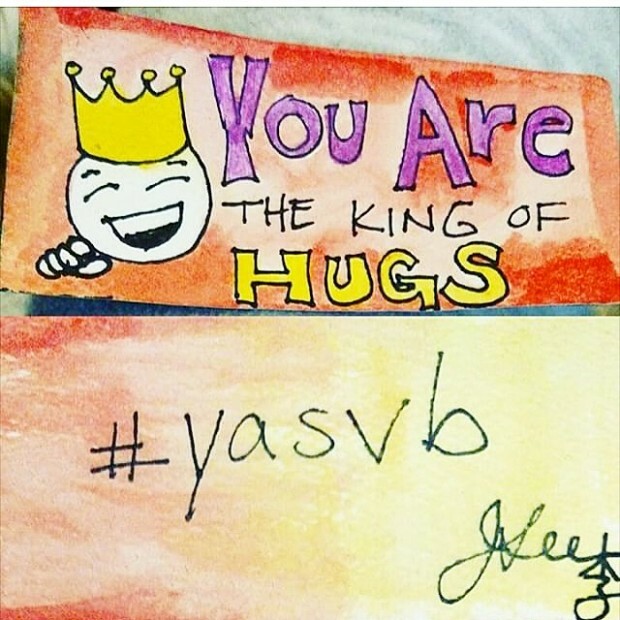 You can see more photos over at Instagram at #yasvb. 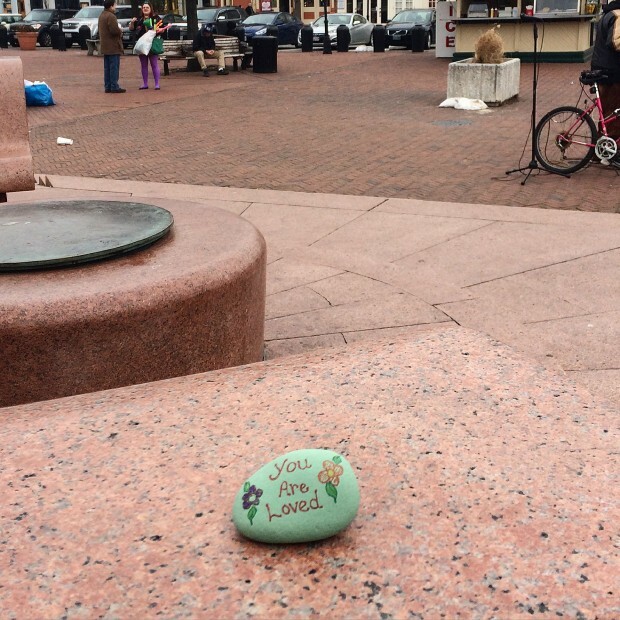 Here are just a few photos that came from February 7th, and they all show that we all need to hear these things, say these things, share these things. 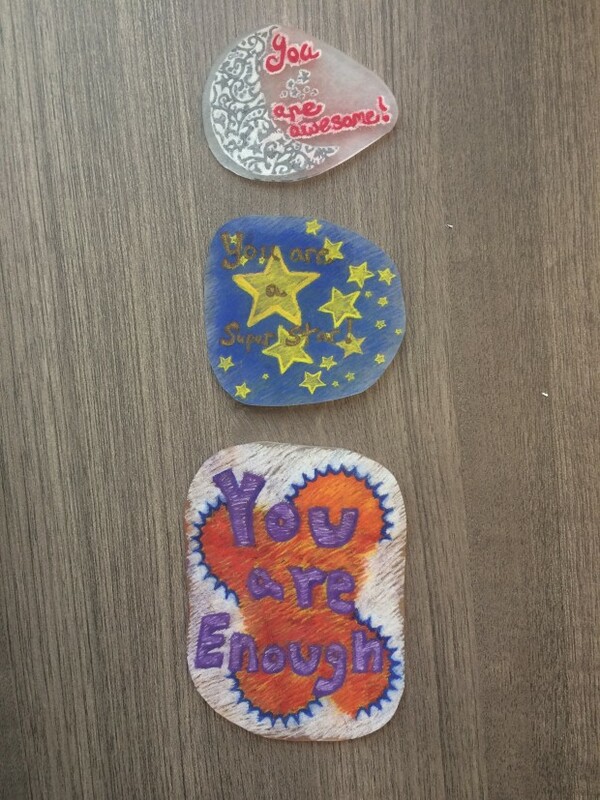 Time and time again, when people finished making these lil’ signs, they would write or say things like, “I really enjoyed making these!” or “That felt really good!” And they’re right, it just feels good down to your bones when you make something that reminds you of how awesome you really are. So, this project is about acceptance. Acceptance of who you are, of how you feel about yourself. Or about saying the things you want someone else to hear and accept, but they’re just not ready. It’s about saying what you really want to say, and then sitting with the poignancy of the moment, whether that’s in the making or in the giving away. Since putting the signs up, we’ve heard from a few people who found them… who told us that they were going to put the signs back out for someone else to find, which is kind of the best. And the loveliest. Thanks to interest from people in other places, I already have dates on the calendar for Atlanta, GA and Cary, NC, and I heard word there’s going to be a drop in Melbourne, Australia too! 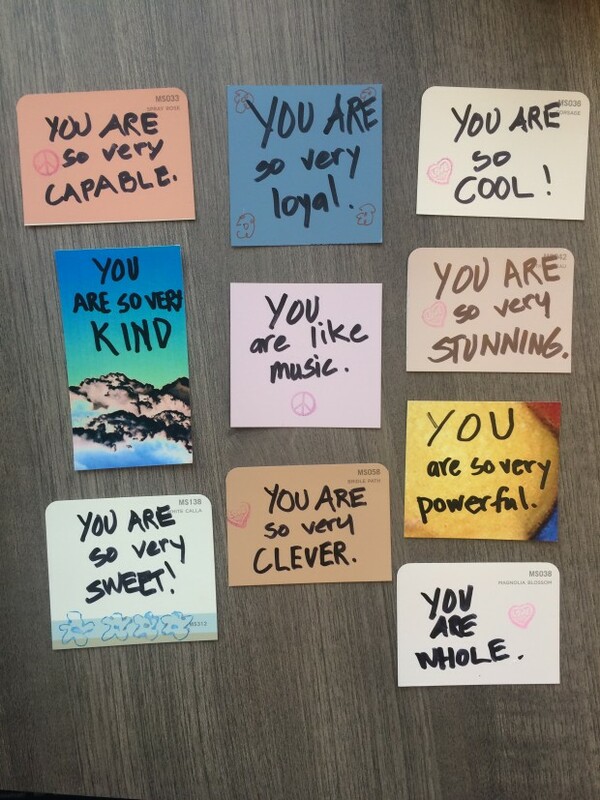 Therefore, we’re (okay, I’m) still collecting signs, so if you’d like to send them, please go here and follow the teeny-tiny instruction list. And remember, you, yes you, are so very beautiful. Want to join in the fun? Go here. Comment. Get our your stitching. Or your paints. Or your oyster shells (yes!). Or your balloons. Because you deserve that time for yourself, that moment of kindness that you need to let come. 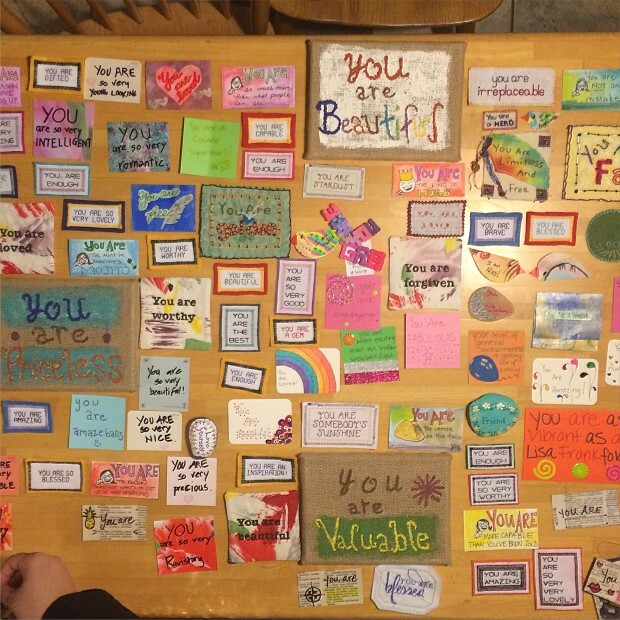 You Are So Very Beautiful commences TWO WEEKS from today! I’m super stoked to be working with Mary on this, and for there to be coordinating drops in both London and Vancouver on the same day we have our event in Baltimore! To learn more about getting involved, have a look over here! 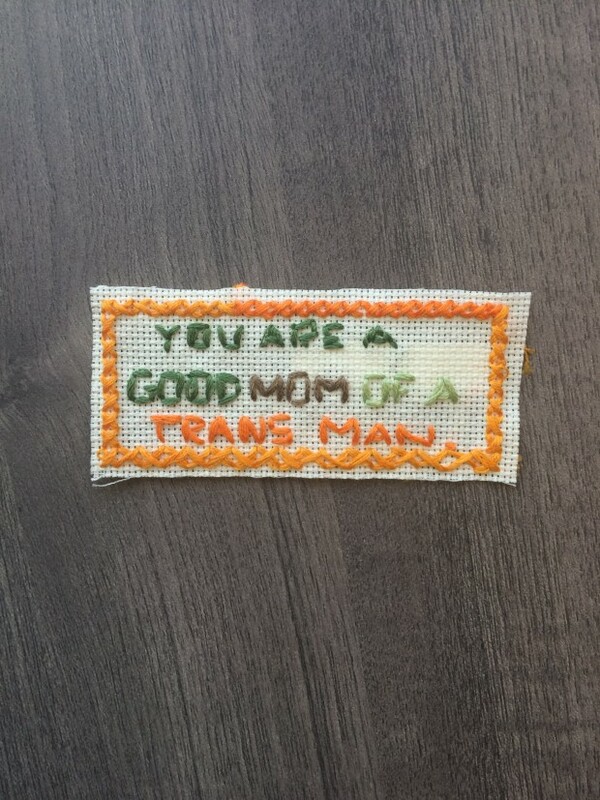 People have also been kind enough to write posts about it on Mr. X Stitch, Katherine Diuguid, Kurbits, Crafting A Green World, Monica Miller and Catherine West from Significant Seams also wrote posts here and here, respectively, and are the ones coordinating drops in Vancouver and London, yeah! For a long time I thought that to create also meant you had to suffer. (I read a lot of stuff by the Beats in college, coincidence?) It took *this very project* to realize how much better it feels to create from a place of joy than a place of sadness or angst or lack. 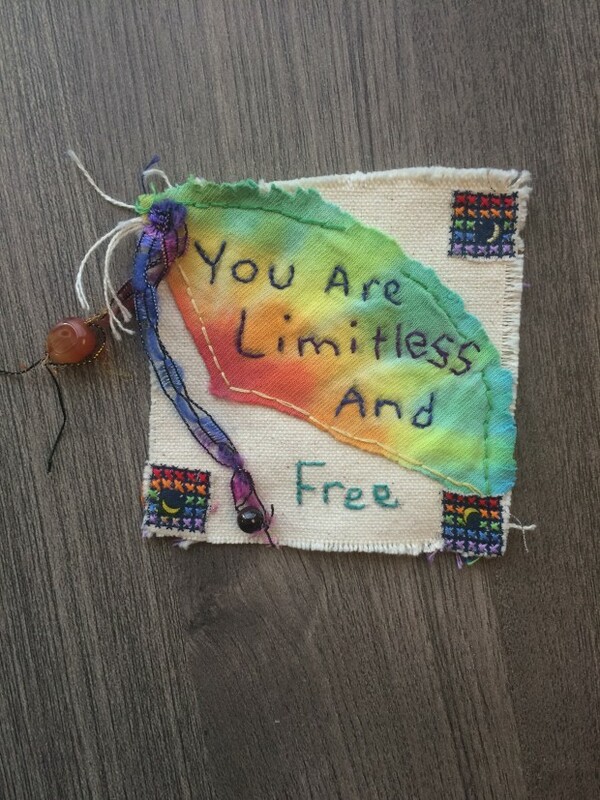 Although I’ve crafting and making for years, it wasn’t until I sat down and literally stitched dozens of affirmations onto cloth that I began to realize how that kind of making resonates on a higher level, a different plane. And it feels good. I’ve written more about it in my weekly newsletter, that just came off a hiatus. You can sign up for it in the top righthand corner of my blog; I hope to see you there!